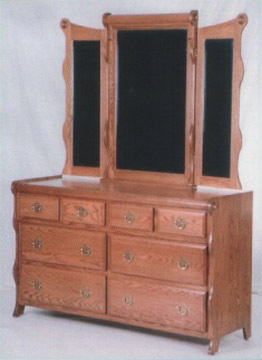 Our 65” Amish made sleigh style dresser is shown here with the optional tri-view mirror with hinged wings. This is the perfect starter size dresser for those who need something a bit larger but still don’t have a lot of space, and with four large drawers and four small, it has the perfect mix of storage space for just about everyone. You can choose any of our optional mirror styles to go with this dresser, and like the rest of the collection, it is also available in solid cherry and is the same depth as the rest of the pieces.